NEW FUN POP MIDNIGHT BLACK. 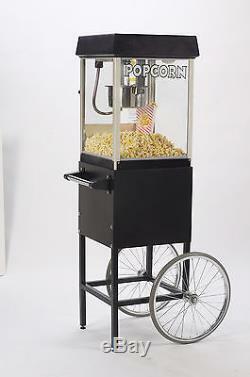 MIDNIGHT BLACK WHEELED POPCORN CART. NEW FUN POP MIDNIGHT 4 oz. POPCORN MACHINE & MATCHING CART FEATURES. OVER FIVE(5) FEET HIGH (60 & 5/8). Popper & Cart Combined Height. USES HOT OIL & Popcorn or PORTION PACK'S (PopCorn, Salt & Oil Combo). FUN POP MIDNIGHT 4 OZ. MIDNIGHT BLACK with Silver TRIM. TEMPERED GLASS WINDOW PANES on Front & Both Sides. E-Z KLEEN STAINLESS STEEL KETTLE. PLEASE SEE the DIFFERENCE BETWEEN This GOLD MEDAL POPCORN KETTLE and the Direct COMPETITION Pictured at Bottom of Listing - GOLD MEDAL KETTLE is the MIDDLE PICTURE! 3 Power Switches System for Ultimate Control and Convenience. 3 Heater Deck & Cabinet Lamp Combo Switch. EASY ACCESS LEXAN (High Impact Plastic) DOOR. 50 WATT LIGHT for Presentation & illumination. POPCORN DECK WARMER Keeps Popcorn Warm & Fresh. DROP PANEL for Easy Scooping and Serving. MAKES 1.5 GALLONS (Volume) of POPCORN per KETTLE PORTION. POPPER DIMENSIONS & WEIGHT : 17"W X 17"D X 24-5/8 H. 120 VOLT, PLUGS INTO ANY STANDARD HOME ELECTRICAL OUTLET. 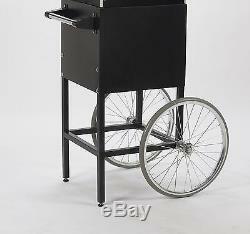 MATCHING MIDNIGHT BLACK POPCORN CART: Model #: 2649MD. CART Dimensions & Weight: 16"W X 24"D X 36 H. 16 Wheels with Ball Bearings. Sturdy Welded Legs with Adjustable Feet. CART HANDLE for Easy Mobility. 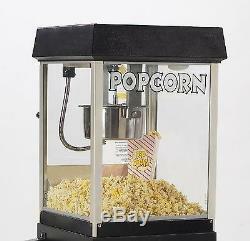 For absolutely any Item you may want or need for Popping Corn, including Supplies to use with any Popcorn Machine! Dd the Ultimate Touch, Mobility & Experience to your Home Theater, Kitchen, Dining Area or Family Room with the. NEW FUN POP MIDNIGHT 4 OZ. And the included Matching MIDNIGHT Wheeled POPCORN CART by GOLD MEDAL. It not only Delivers Delicious Movie Theater Popcorn, but put's on it's own Show as you Watch the Kernels Pop, Hear that Unmistakable Sound, and Smell that Unforgettable Aroma! This Excellent Product Becomes the Main Attraction in any Place or Event! Also great for Small Retail Shops, Concession Stands, Snack Bars, Offices, Breakrooms, Indoor and Outdoor Employee events or functions of any kind! Sorry, but we Cannot accept any Personal Bank Checks. Post Office Address, or Locked Gate Address. UPS will simply not deliver to these types of addresses. Perhaps a Friend, Family Member, trusted Associate, or even to a business if you know someone who owns one. Just look up the closest UPS Depot or Store in your area and advise us of the address. They will call you when the items arrive there and you can make arrangements to pick the item up in person. UPS GROUND Cost to the Continental USA only. That's the lower 48 land locked States. That's only to the Lower 48 Land-Locked United States. But it can take up to 3 if they are busy. Sorry, but Gold Medal no longer sells Export Equipment (240 Volt) to their Authorized USA dealers. They also have exclusive Export Contracts in place. Protectorates or Territories, Canada, Mexico, or any other International Location. Only Carrier Damaged or Defective Items or Parts will be Replaced for free. Pictures of damage is highly recommended to expedite replacements. The item "NEW BLACK FUN POP 4 OZ. POPCORN MACHINE & MATCHING CART" is in sale since Saturday, November 25, 2006. This item is in the category "Business & Industrial\Restaurant & Food Service\Vending & Tabletop Concessions\Tabletop Concession Machines\Popcorn". The seller is "jgbachman" and is located in Cincinnati, Ohio. This item can be shipped to United States. Model: Fun Pop Midnight Black 4 oz.